This design was produced by Tim in 1997 and 1998 to a maximum of 10 of each shape. There were originally 5 perfume bottle shapes and 3 unusual vases, but no written records exist showing these items. Most of them were sold outside the UK and there is no certainty that the full quota was fulfilled. All pieces are signed and dated by Tim. The production method is unique to Tim, a description of which can be read under Charleston. 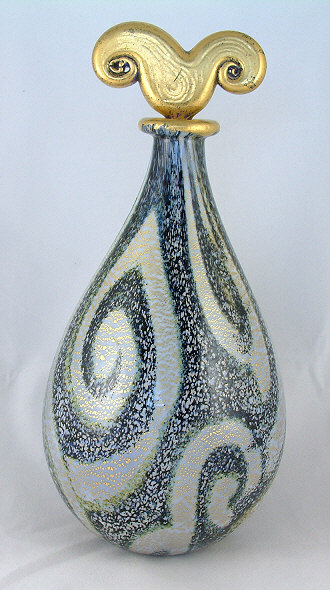 Pear-shaped perfume bottle, 21 cm high, 9.5 cm diameter. Signed “Timothy Harris IOW Glass England 1998 5/10”. Flask perfume bottle, 16 cm high, 14 cm diameter. Signed “Timothy Harris IOW Glass England 1998 4/10”. 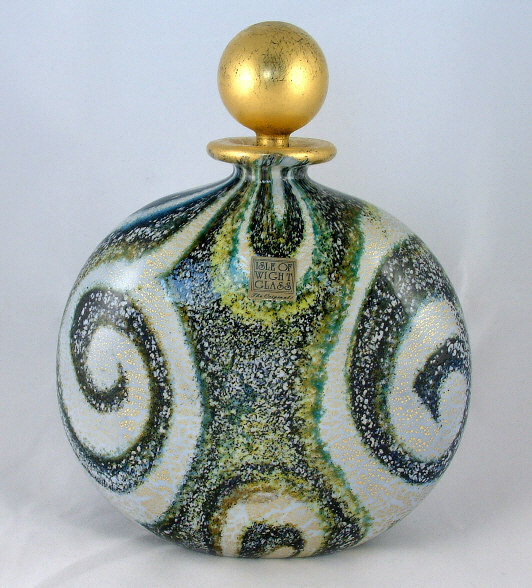 Globe perfume bottle, 15 cm high, 9 cm diameter. Signed “Timothy Harris IOW Glass England 1998 2/10”. 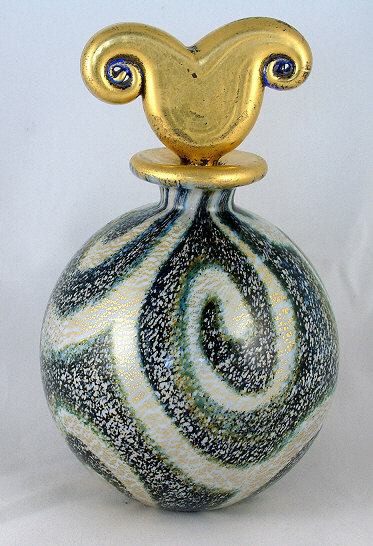 Conical perfume bottle, 21 cm high. Signed “Timothy Harris Isle of Wight Glass England 1997”. It was bought directly from the IOWSG archive in 2011. A cylinder vase with an unusual shape, 23 cm high. Signed “Timothy Harris Isle of Wight Glass England 1997”. It was bought directly from the IOWSG archive in 2011. An unusually shaped cylinder vase with a slight flare, 17.5 cm high. Signed “Timothy Harris IOW Glass England 1998 2/10”. It was bought directly from the IOWSG archive in 2010.